Sorry for my delay in updating this blog. Things got so busy because I've been baking lately. I am still contemplate whether to reveal my "cake" here. Well.. Ok just in case you have missed out my previous blog posts on Mabul Island, here are the links! Benjamin told us to learn and practice the skills he taught us. If we manage to keep our composure, and do the right thing, he will reward us with some photos of us. 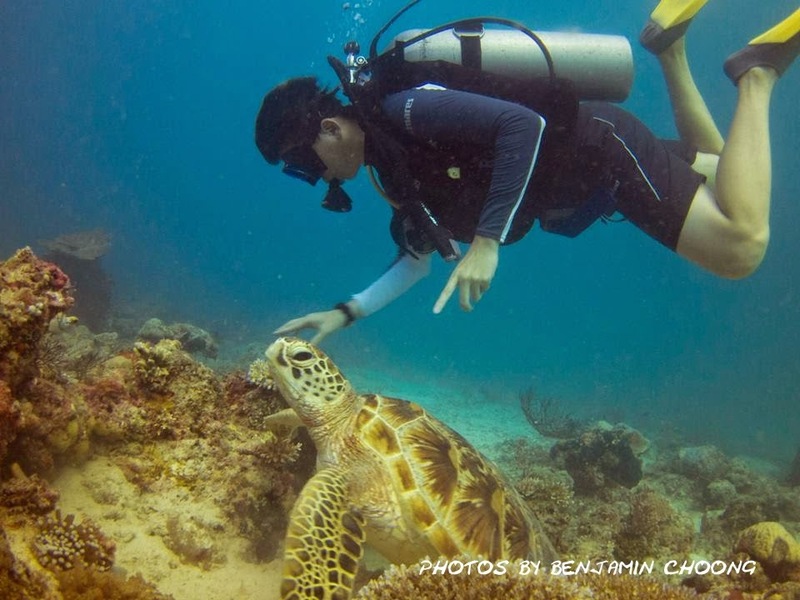 Then on our 4th day of dive, he nonchalantly took out his camera! YAY!! I guess we must have been a bunch of outstanding students that we earned a photography session with Benjamin. 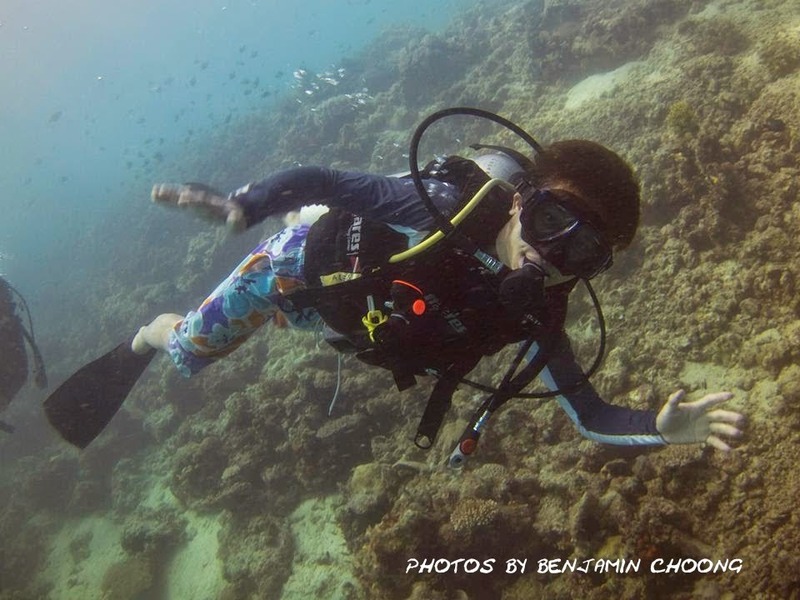 For your information, one of Ben's many talents was underwater observation and photography. He can spot many weird sea creatures, such as kecik-mayong (very tiny) sea horse and sea lice (direct translation of kutu laut). To have our photos captured by him was an honor. So, basically, after few days of dive, how do I feel? I was very enthusiastic. There was two moments which I still could feel the "adrenalin rush" until today. The moment we put our fins on, right hand hold the inflator, and left hand holding my mask and regulator. Count 1, 2, 3 roll back from the boat! When I'm all in the water, my second most "panicky" moment was when we descend, and when the water level was between surface and water. From the surface, you will see as though it was really shallow, everything is OK. But once your head is underwater, it seems so blue, so deep, so eerie. But keep calm and my body adapted to this whole new world that I have never experienced before. Initially, school of fishes frightened me. I was afraid that maybe come of these organisms may attack me. But I know I can wipe those silly thoughts away, when I see those fish, octopus, squids and divers were happily roaming around. 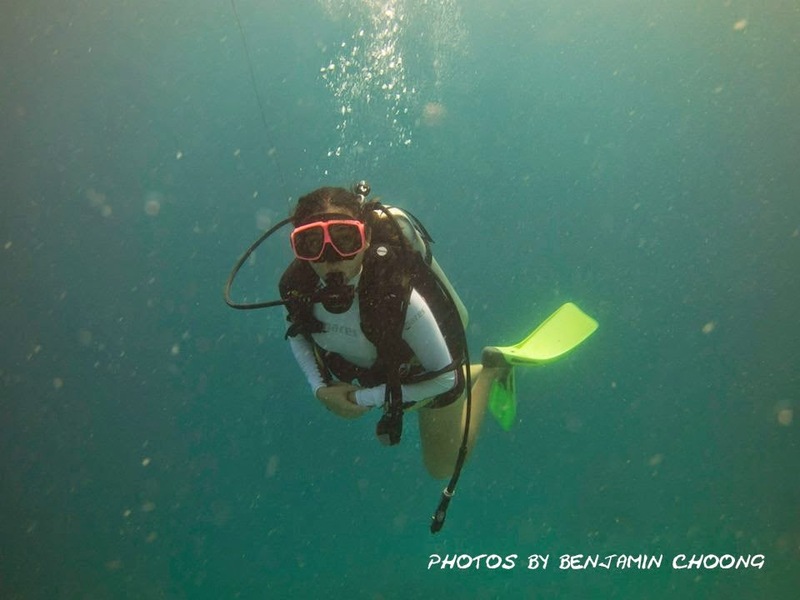 The water visibility was so clear, I felt secure. The thing that I should be afraid of is to NOT damage any of this natural treasures. 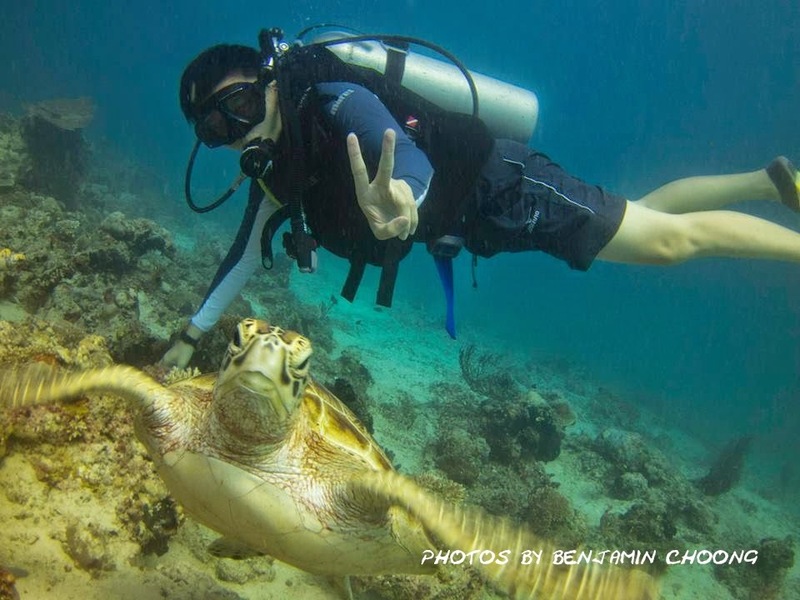 I've seriously never seen turtles (in the sea) before coming to Mabul Island. 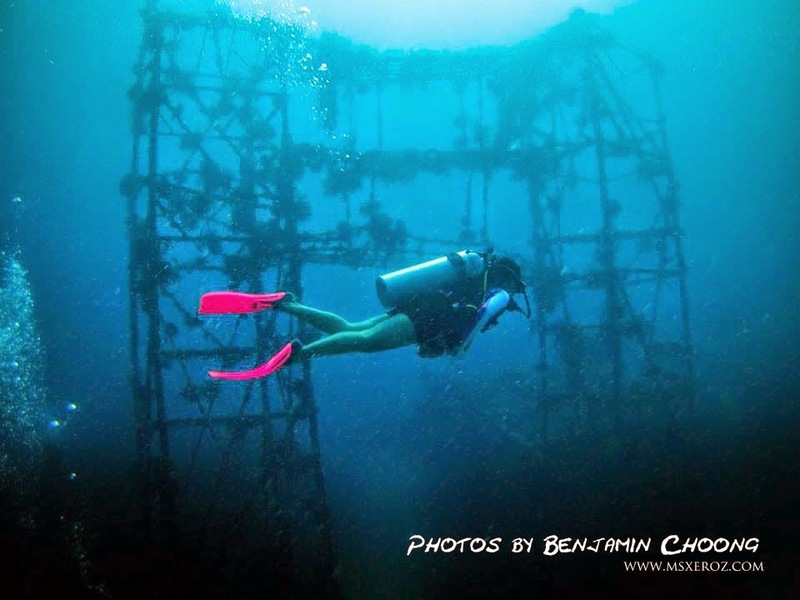 During my first dive here in Day 2. I remember vividly that there was THREE CRAZILY HUMONGOUS TURTLES lying around an artificial shipwreck. Benjamin wanted me to hold onto the ship and look at the turtles, but I gostan because the turtles were so big that I worry if it farted on me, I would WHOoooooooooooshhhhh back to the surface! I was scared. But he pulls my hand and for one whole minute, me and one of the Giant Turtles there had eye-to-eye contact! The turtles were very gentle, and polite. Some kind of stupidity got the better of me, and I opened my mouth (which was supposed to be occupied by my regulator) and said "HELLO TURTLES"
That was the most stupidest thing I've ever done. I really did that gesture and tone without thinking as though I'm talking to Fluffy, my rabbit. Then the sea water oozes in my mouth and I nearly choked. My whole mouth cavity is salty now. Well, then I realised that, my throat isn't that dry anymore after that incident! Breathing on regulator will make our throats dry and sometimes we will cough underwater. Ben did tell us to sip some water in to stop our throats from being dry. So, this is how it helps! Turtles were everywhere. Just before this photo was taken, we spot an eel with it's head sticking out from the sea bed and its mouth wide open. I swore that I saw that eel has teeth! Ewww.. I was really intimidated, because its head was so thick and large, and god, I wouldn't want to know how long its body is! So this is Wern, my sister. 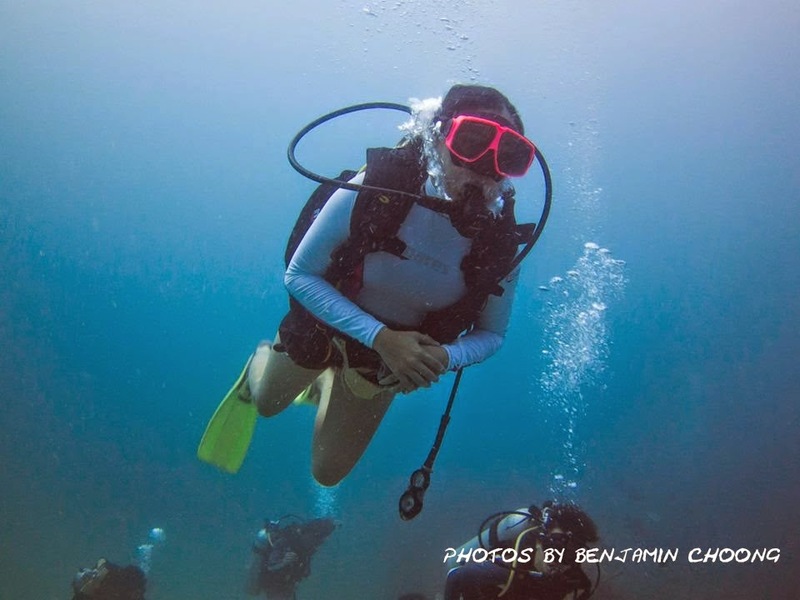 I don't know whats wrong with her, but perhaps she has a lot of fart inside her intestines that she couldn't sink during our initial dive trip. Not to underestimate her, she swims like a polite woman. She's the real epitome of a person who conquers her fears of water. She is really afraid of water. Like SERIOUSLY! The only time I see she enjoys water is during her daily bathing sessions, other than that, water is her nemesis. 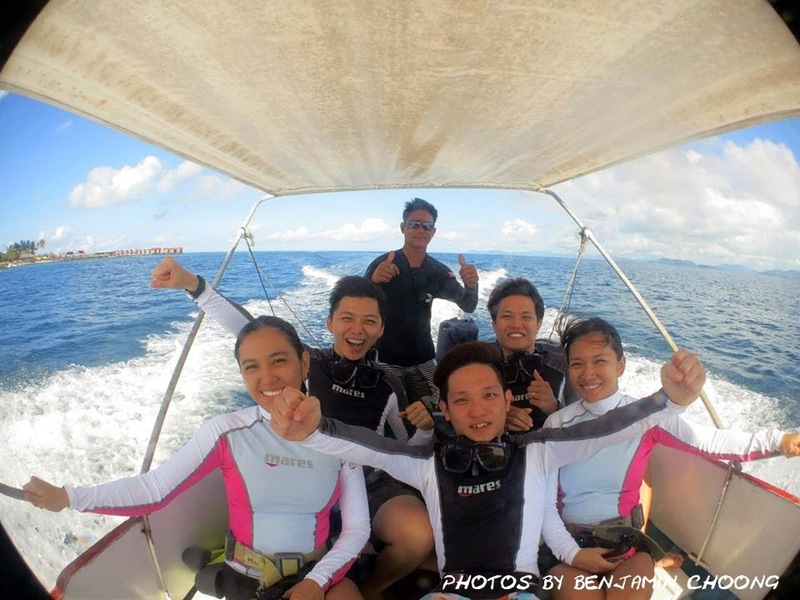 During her Day 4 of diving in Mabul, she triumphed against her fears. 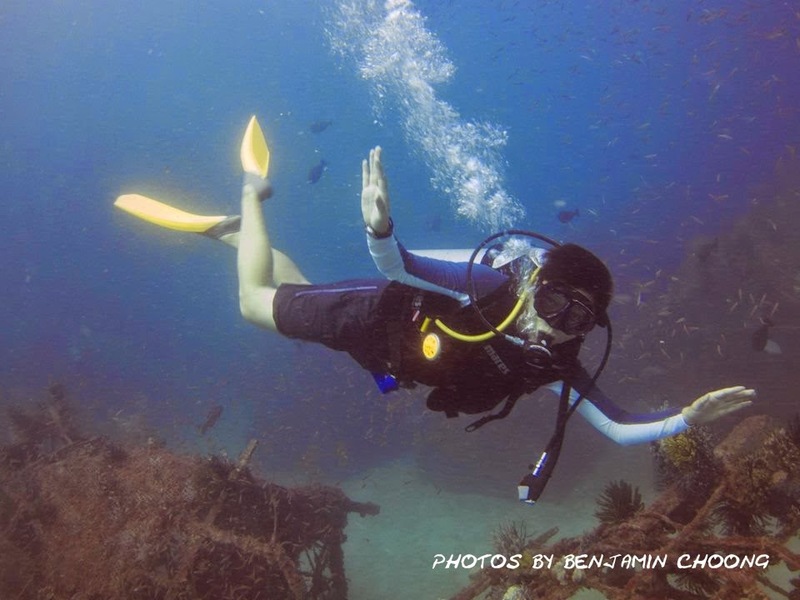 Now's she's all addicted to diving and cant wait for the next trip! So overall, It was a fantastic experience that money can't buy. In our daily routine of life, some thoughts come and go, I blabber whatever that comes to my mind. In the water, with the regulator stuck in my mouth, I became more aware of what's on my mind. Every little thing I see, and something will come into mind. Every moment is preserved in me in that way. So, as I promised. 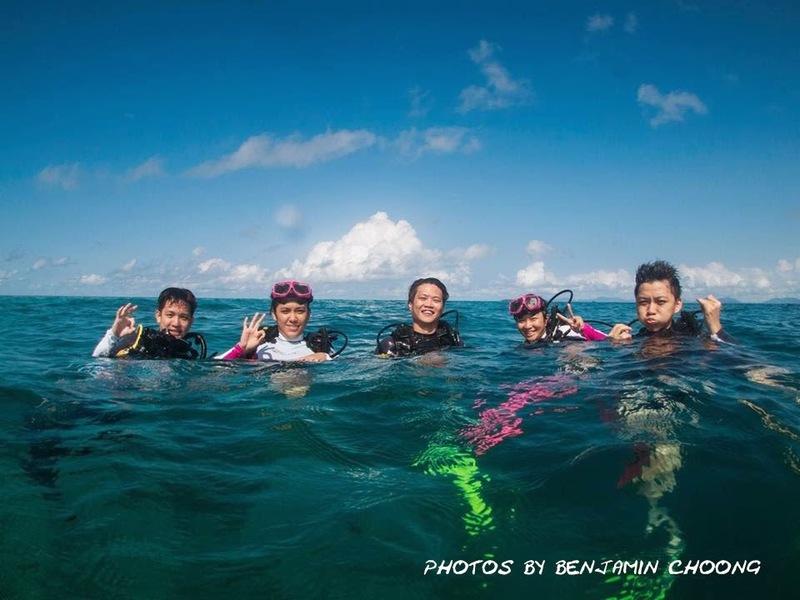 Here's a video of our trip, specially recorded by Cikgu Azhar. To be honest, everybody that I met in Spheredivers Lodge seems to be really talented. Azhar Adnan seems to be a serious person, someone not to be messed with. But at the end of the day, all hell broke loose and he was a really funny dude! His photos were all so amazing, you can check out his Facebook here. wowwww! nice i always wanted to learn scuba diving!! and that island so nice! water so clear! Yups, i knew of that trick now. hehe. @Henry Tan, must learn!!! it's something you wont regret! I Wanna Win A Getaway with Seeties! Sekkisei Lotion Mask by KOSÉ Review & Giveaway!